At New Attitude Sports International, we create styles that make it easy for you to feel good about looking good. Build a strong brand name for quality products from multi-cultural designs. Actively support the multi-cultural communities we draw inspiration from, serve, and sell to. 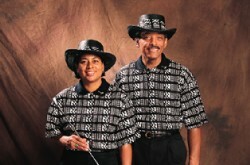 New Attitude Sports International was established by its owners, Tony and Sue Peters, in 1998. The idea for the company, however, was spawned two years earlier when the pair were attending an art festival in Atlanta. As the couple was getting dressed for one of the events, Sue asked Tony if the polo shirt he planned to wear that day, which had a colorful ethnic pattern, was a golf shirt. It wasn't, but Tony said, "What a terrific idea!" Thus, the journey began. 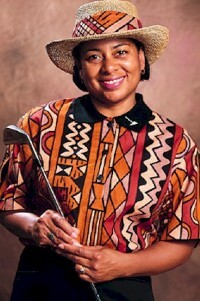 New Attitude Sports International, whose owners are African American, designs, manufactures, and distributes a full line of golf lifestyle casual wear for both men and women. Our fashion forward styling uniquely positions us to capture significant market share in the underserved segments of the sportswear and golf apparel marketplace that have recently been energized by the emergence of young, exciting, multi-cultural sports personalities. As Tony says, "We make it easy for people to feel good about looking good. We give those with stronger style sensibilities the opportunity to wear more expressive sports attire. So even if you play bad, you can still look good. Everyone needs a New Attitude!" 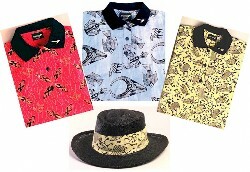 Please take a moment to look through our fashions For Him and For Her. Break the Pattern! Change Your Attitude! Order Now!